Hoping to develop more homegrown players and improve their MLS product, the Sounders are bringing an expansion team to the USL Pro League in 2015. 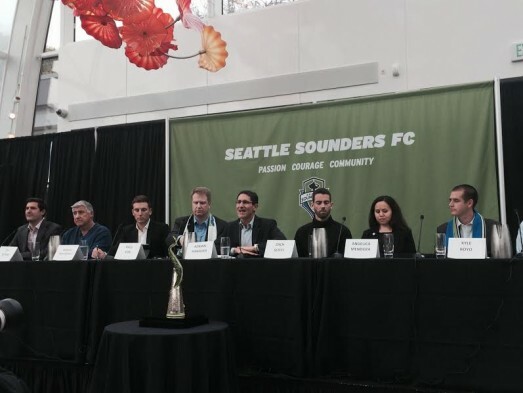 Looking to boost player development, Seattle Sounders FC will launch a USL Pro team in 2015 — Sounders FC 2 — general manager Adrian Hanauer said Tuesday at a gathering at the posh Chihuly Garden and Glass center at Seattle Center. In an unorthodox move, a fan-led, non-profit organization will hold a 20 percent ownership stake in the club. As with its MLS affiliate, Sounders 2 will train at Starfire Sports complex in Tukwila, 20 minutes south of Seattle. The hope, Hanauer said, is that having a minor league club in USL Pro will better prepare “homegrown” players trained in the Sounders Academy for a potential career in MLS, while providing a competitive environment for Sounders rehabbing injuries. “Until now, we did have a bit of a gap in our development,” Hanauer said. “A lot of people will say that our 14, 15, 16, 17-year-old players are as good as anyone in the world, but at 18, 19, there starts to be a bit of a gap. S2’s introduction comes at a time when MLS is increasing its influence in USL Pro. As in Europe and other leagues overseas, more MLS teams are having reserve franchises play in lower-tier pro leagues to develop better players. The Portland Timbers announced Tuesday the formation of their own second team, Timbers 2. They begin play in USL Pro next season. Meanwhile, the Los Angeles Galaxy in 2014 became the first MLS franchise to own a secondary team in USL Pro, with Galaxy 2. The need for any MLS club to have a professional minor league franchise is obvious. Hanauer declined to offer specifics when asked the cost of launching S2, saying that it will take “millions and millions of dollars” to grow the organization. Andrew Opatkiewicz, who most recently worked at the marketing firm Intersport, will serve as Sounders 2’s general manager. In a press release issued by the club, he expressed optimism the team can help grow the sport throughout the region. “Over time I think this move will prove very important to the development of world-class first team players from the Puget Sound,” he said. USL Pro had 14 teams in 2014. The league is quickly expanding. New franchises are expected next year in Austin, TX, Charlotte, NC, Colorado Springs, CO, Louisville, KY, St. Louis, MO and Tulsa, OK, with more to follow. That’s welcome news for a player like Sounders defender Zach Scott, who spent seven years with the USL-1 Sounders from 2002 to 2008 while trying to make his way to MLS. Attending the announcement ceremony, Scott was named the first member of the Sounders Community Trust. This will be great for player development. Can’t wait to get this rolling. Just wish the name and crest weren’t so underwhelming. What is the salary structure for the players? Meh. This is little more than the U23’s on steroids. And 20 percent ownership for some 501(c)3 that gives the average fan the illusion that it’s really “their” team? Woo-hoo. The German league has featured “reserve” sides in the lower divisions for a while. Not a bad idea to follow what the Germans do. 3 Lions, the USL Sounder players needed day jobs to supplement their income, so I am guessing the same will go for Sounders 2.